Why theater? : I used to make films and have exhibitions but after opening night I missed the audience. There is nothing like the buzz of performing in front of an audience in a show and even better if it's going well. 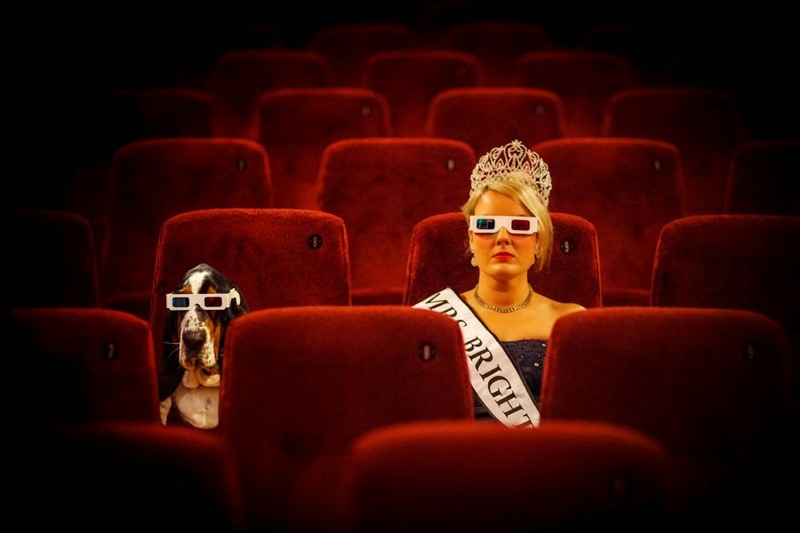 Tell us about Major Tom: Major Tom is the story of how an I - an average 34-year-old became a beauty queen and how my unruly pet basset hound, Major Tom, became a championship show dog. Major Tom and I increasingly immerse ourselves in the obsessive and confusing realm of personal scrutiny as we participate as genuine contestants, determined to win. Accompanied on stage by documentary film footage and my dog, I tell this true story. It explores the British fascination with celebrity, beauty and winning. What is it like being a part of Major Tom? : We have performed this show over 100 hundred times. It has my pet basset hound in it and he's free to do whatever he wants. You never see the same show twice because he is free to roam and do as he pleases. Due to this there is an aspect of improvisation that always keeps the show fresh. Sharing the stage with my dog is a real pleasure. I am very enthusiastic and he looks depressed the whole time - we make a very comedic duo. Some papers have called Major Tom the dog a comic genius. What kind of theater speaks to you? What or who inspires you as an artist? : When I'm in New York I'm going to see the Wooster Group. I like political work that acts to change the world even in some small way. But it can't take itself too seriously and if there is humour than even better. I want theatre to experiment with form so you come out of the theatre having never experienced anything like it before. I am a big fan of British Alternative comedian/ activist Mark Thomas. The last best show I saw was GATZ by Elevator Repair Company - it's 6 hours long. Any roles you’re dying to play? : This is difficult because I always play myself. But there is a show that I will be making next year called Ugly Chief. I'm making it with my dad who got wrongly diagnosed with a terminal illness. The show examines our relationship, funerals and blues music. So in this show I share the stage with my non-actor dad and I play the role of daughter. It's going to be hilarious as dad is a very unique character but it will also be moving because of the subject matter. If you could work with anyone you’ve yet to work with, who would it be? : Grayson Perry or Jeremy Deller both amazing British artists. Their talent lies in their insightful observations and they create powerful work that is both accessible and beautiful. Who would play you in a movie about yourself and what would it be called? : A university lecturer wrote a reference for me that simply said she's either an idiot or a genius it’s up to you to decide. It's offensive and complimentary at the same time, I've always been very taken with it as a quote. So my film would be called "Idiot or Genius" and I would ask Juliette Lewis to play me although she is a hundred times cooler. If you could go back in time and see any play or musical you missed, what would it be? : I remember reading about these Dadaist performers who packed out a theatre in Europe. There was huge anticipation for this show and a great marketing build up. there was music and the curtain came up and the audience went quiet. The performers stood before the sold out audience bowed and left. That was the show! There was outrage and nearly a riot. The Dadaists were so innovative and funny I would have loved witnessed that show. What show have you recommended to your friends? : Bryony Kimmings makes consistently ballsy, great work. What’s your biggest guilty pleasure? : Reality TV shows but I convince myself that it's allowed because it's sociology research. To be honest sometimes I'm so tired from work I want to switch off my brain and watch some trash. What’s up next? : When I was competing in beauty pageants for a previous show a hairdresser advised me that I needed hair extensions. Freaked out by wearing a piece of somebody else’s body I set out on an extraordinary adventure to find out just whose hair this was. My boundless curiosity takes a live audience on a serendipitous journey around a world in miniature. There is a real life baddie, a saviour in the shape of a Bollywood financier, the most expensive wedding to have ever taken place, a Celebrity Big Brother contestant, forensic crime scene investigations and hair lots of hair. Sacks of it. What transpires is a deceptively simple true story about the search for three unrelated strangers from different parts of the world connected by DNA. It’s going to be directed by The Team’s Rachel Chavkin and we will be taking it to Edinburgh Festival this August.